So, there's a lot of talk about how Android is only for 'free Apps'. 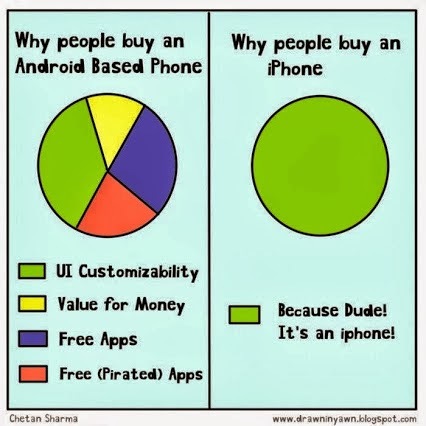 C'mon, it's the 'cheap phone' and how nobody makes money on Android apps, because nobody buys them. I'm being sarcastic, but there's literally dozens of conversations every day by folks out there who actually believe it. I had a student who once said "Android is no good, you have to ROOT IT in order to get any apps on to it". I almost pounced on him, but merely just challenged his theory. He had no retort... just a strong held belief that that's what someone told him. I know it was meant as a joke, but I like to think of our community as a much more developer friendly one. We should be supporting our developers of Android... it's them who make this OS awesome. (I so wish there was a method of reporting those folks who proliferate paid app APKs on G+... I report them as SPAM as much as possible). On my post there was a comment saying "I don't feel the need to buy any apps"... and that's true. There's TONS of great apps out there for free. But there are some really good ones that are worth paying for as well. +Adam Moreau even suggested there ought to be a database... and you know me and databases... so here's this week's poll!